Today I wanted to share a combo currently crafting/really easy tutorial and a reminder that it’s totally okay to give yourself a break by doing things the ‘easy way’ when you need to! While we were in West Virginia, I decided I wanted a few pictures of me holding various things (items for craft tutorials, flowers, leaves, etc.). 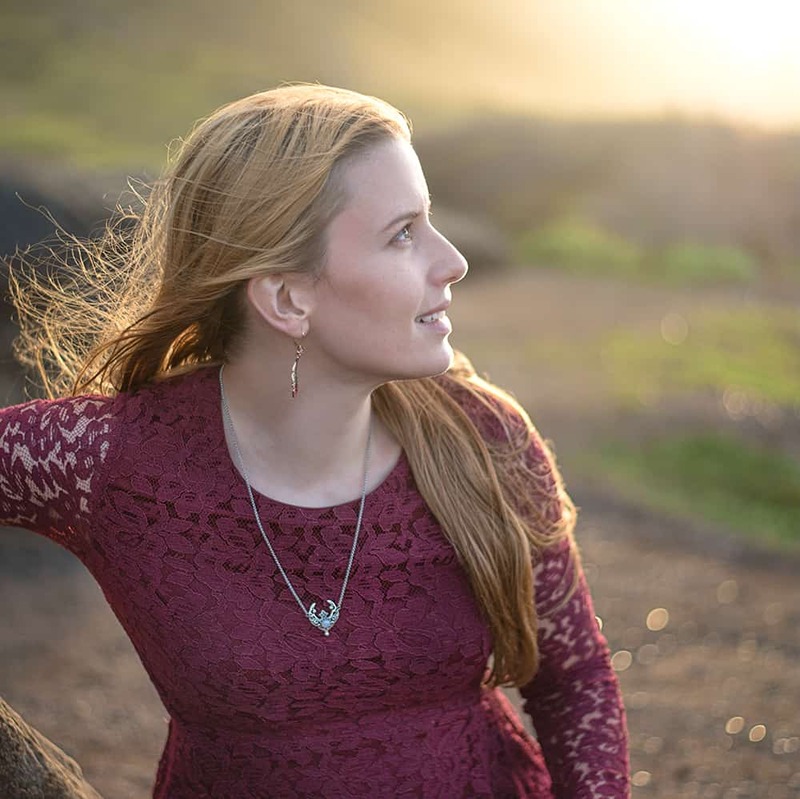 I quickly discovered why you frequently see people wearing lots of bracelets in photographs like that – wrists and forearms can be really distracting! I decided to make a few bracelets to layer on for photos, but gave myself permission to do things the ‘easy way’ with some supplies that were practically finished finished bracelets, already. 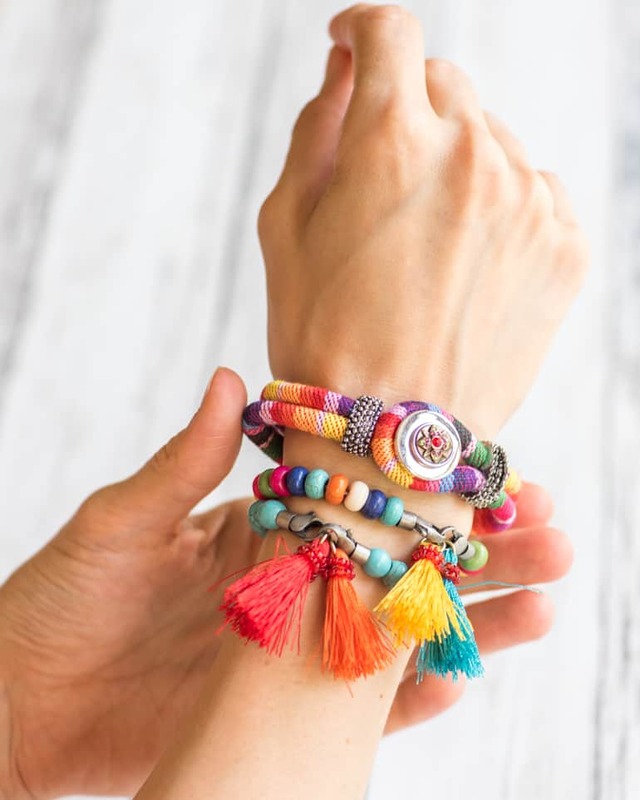 Today I’m showing you my new bracelets and sharing easy DIY bracelets ideas with tips for making convenience supplies like these work for you! This post is not sponsored by Hobby Lobby (wouldn’t that be nice??). They happen to be the ‘local’ craft store where we’re living now and everything I purchased was on sale for 50% off (hooray!). I’m sure other craft stores have their own similar brands of supplies and that these ideas will work with them, too! The supplies I purchased were from two collections, but most of them were from their aptly named Instant Gratification line. Try your best, within the limits of the packaging, to try bracelet elements on for size. But please be considerate and don’t damage the packaging for materials you’re not buying! I have a significantly smaller than average wrist, so many bracelets are too big for me. If your wrists are larger you may find that the opposite is true! 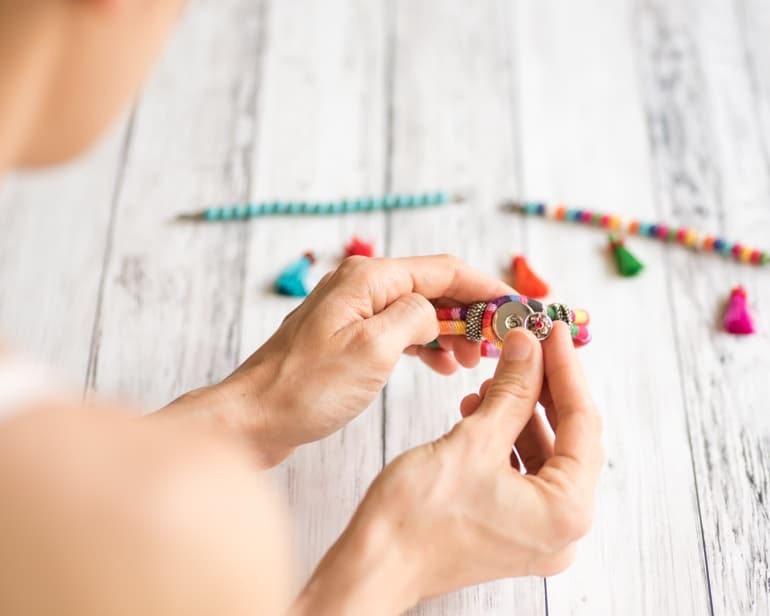 If you have small wrists/the bracelets would be too too large for you when assembled ‘as intended,’ look for other ways to complete the bracelet. For example, I purchased two bracelet components that are just beads on stretchy string with a lobster clasp at each end. They were “supposed to” be attached to these pieces that were an inch or so long, which would have made the bracelets far too big for me. Instead of buying one of these larger focal pieces, I just added a couple of hassle charms and hooked the two clasps together! If the bracelets would be too small for you, you can also combine supplies in creative ways. Add chain, jump rings, or extra charms/focal beads to increase the bracelet’s size. 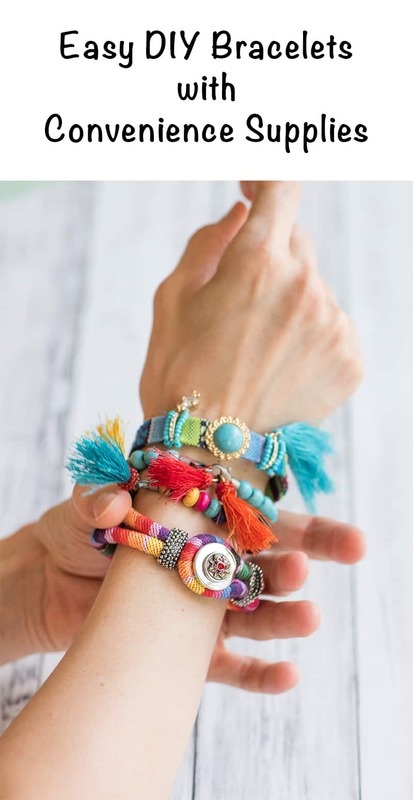 Try fastening multiple bracelets together and turning your creation into a wrap bracelet. For example, three of the stretchy bracelet pieces I purchased daisy-chained together could make a two wrap bracelet for someone with a larger wrist. Don’t be afraid to use components in “unintended” ways. There was a set of charms clearly meant to be turned into earrings, but I almost bought them to use as charms on a bracelet, instead! Conversely, don’t feel like you have to find make something more elaborate. It is also completely okay to just grab a couple of things, stick them together, and wear them! I got a cuff with a snap on decoration and didn’t change a thing about it. It can be so hard to let go of the compulsion to do it all yourself, but it’s totally okay to take it easy some times! 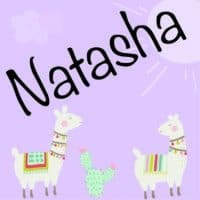 Enjoy yourself and let go of any crafter guilt! It’s seriously totally okay to take the easier route when you need to, even if you technically could have done the entire project from scratch. I’m so glad that I gave myself permission to make a few easy bracelets to wear in photos! They’ve already become a favorite photo prop. 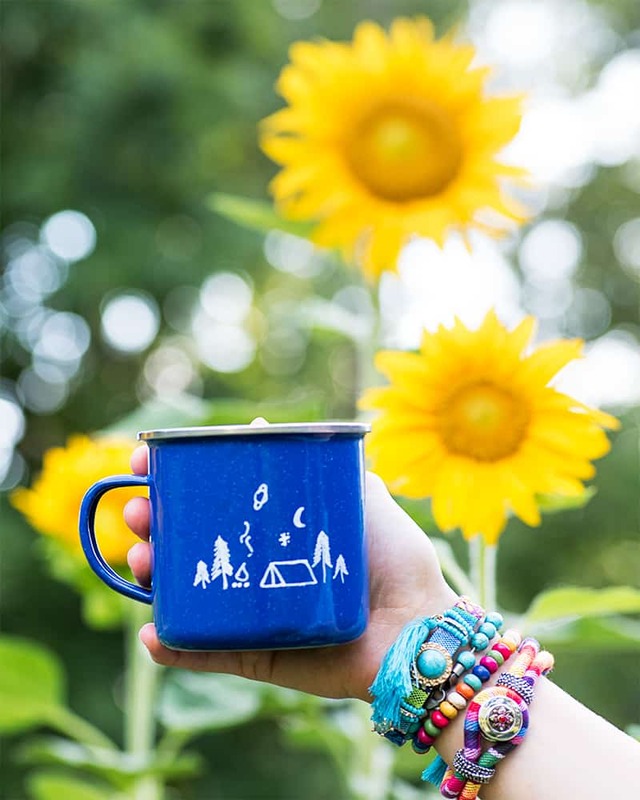 You’ve probably seen them in a few posts both on the blog and Instagram, like in last week’s tutorial for a DIY enamel camp mug. They’re also absolutely perfect for styling with my mom’s cheerful sunflowers! This photo was for a post on my Skillshare series on getting to know your watercolor paints. You can find out more about those classes right here! When do you allow yourself to relax and take the easy way? Do you make cakes from mixes sometimes, even though you can totally make a killer cake from scratch? Bake brownies from a box even though your truly homemade brownies are undeniably better? These are really lovely! So colourful and bright too! Previous post: How to Paint Transparency Swatches with Watercolors is Live on Skillshare!